About 70 years ago, a lifetime for many, a man named Howard Stevenson spent his days going door-to-door selling this and that to neighborhood folks in Woburn, Massachusetts. When he heard about a new rodent exterminator that had just hit the market, he jumped on the chance to be one of the first to offer it. It was a hit, and in many ways, that was the beginning of Modern Pest. Over the years, Howard and his family have grown Modern Pest from a door-to-door effort to the entire northeast; from Salem, New Hampshire to Augusta, ME and back to Massachusetts. Modern Pest has grown immensely from the rodent exterminator it started with, to include the most Integrated Pest Management (IPM) systems around. And we owe a lot of that to one thing: Sticking to our Philosophy. 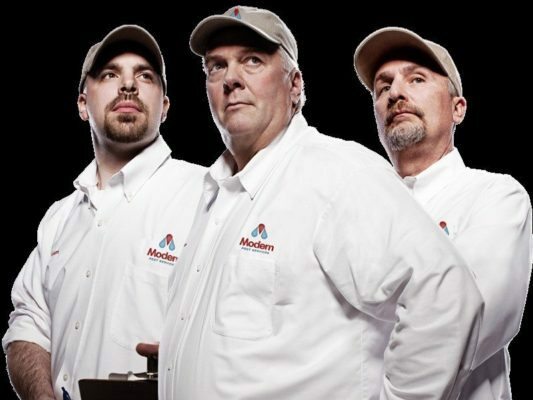 We want to be the biggest pest management company around, and that means you have to do things right to stay in business. We work hard to provide our customers the best service they can get, and that has brought us from the 80th largest pest control company in the country – all the way to the 42nd largest in just a few years. Imagine what a few more will bring. Providing the best service around makes our mission that much easier. But really that mission is simple: Become the most recommended pest management professionals in the nation. Yep, country-wide. Becoming 2012 Angie’s List Super Service Award winners is just one step in that effort, given only to the top-rated five percent. Our big hearts will continue to help us reach big goals. To have a strong vision and be dedicated to our mission, our values have to be strong, too. But the most important part of all of those values is that our integrity not only remains intact, but acts as a cornerstone of our company. That makes doing the right thing easy, every single time. Maintaining a five-star rating with the Better Business Bureau is just one example of our efforts. Modern Pest is always looking for ways to improve, to offer you the best in pest management each and every day. Through environmentally-sound processes like IPM and limiting the number of pesticides and chemicals used, we are providing our children a much healthier future. We look forward to what the next 70 years will bring our company, our clients and our country!